Polka dots and bright floral give this contemporary quilt design pizzazz! 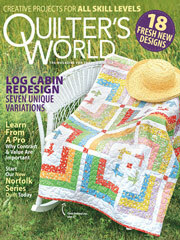 This e-pattern was originally published in the April 2009 issue of Quilter's World magazine. Size: 39 1/2" x 48". Block Size: 6" x 6".